This is one of my favorite fruits that I love to have in the morning for breakfast. Papaya is available all year round in Thailand and there are a few different type of papaya to choose from. The one you see is what we call Holland Papaya, probably because this type of papaya originates from the lab in the Netherlands. I love them best because they have thick sweet orange and fragrant meat with fleshy texture. The other types get spoil easier in my opinion. 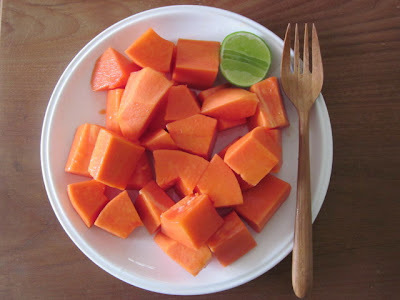 The Thai people will have ripe papaya without any extra sauce or chili. I learnt to have it with lime from my German teachers and now a ripe papaya without lime is almost impossible for me. Indian people have it with a bit of ground Pepper.